When I let my Mac idle, iChat was NOT open. I never use iChat and would really like this dialog to go away permanently. I don't want to use iChat, period. And I certainly don't want to have to quit iChat every time I wake my monitors. iChat is not in my login items, all of the accounts have been removed or disabled, and I don't know of any other setting that might be causing this. I thought I had licked this problem before, in fact I was so proud of myself (after searching for a solution for hours) that I blogged about it. But alas, after I restarted my Mac, the problem returned. I don't have Chax installed (this question asked how to get this behavior, the opposite of what I'm looking for). I'd be quite happy to uninstall iChat completely, if there were a way. I've considered some of these software removers like AppZapper but I suspect they will be unable to remove iChat for the same reason I can't. My menu bar looks like this. Do you have webcam on those monitors? Integrated or attached to USB or FireWire hub on the monitor? Check that there are no start up files with in the following folders relating to iChat in /System/Library/StartupItems or /Library/StartupItems. 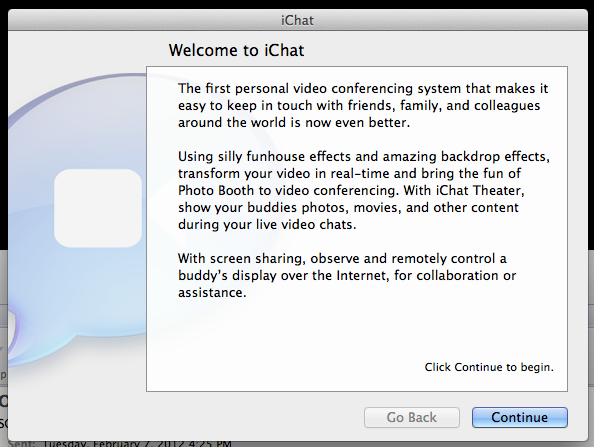 I would check to see if there are any launchd Daemons relating to iChat. Assuming your mac was sleeping when you wake it and the monitor. It looks like there might be a way to explain what is happening via a launchd's StartInterval and StartCalendarInterval options. YourUserNameHere/Library/LaunchAgents Per-user agents provided by the user. /Library/LaunchDaemons System-wide daemons provided by the administrator. /System/Library/LaunchDaemons System-wide daemons provided by Mac OS X. If you still don't see anything in the above directories, lets see if launchctl can provide any more information. If iChat is not running there should not be anything iChat related listed in the launchctl command output above. If there is than it might be a daemon that is restarting iChat when you don't want it to. Finally, if you really want to you can uninstall iChat by moving it from the Applications folder to the Trash. Not the answer you're looking for? Browse other questions tagged lion macos ichat . 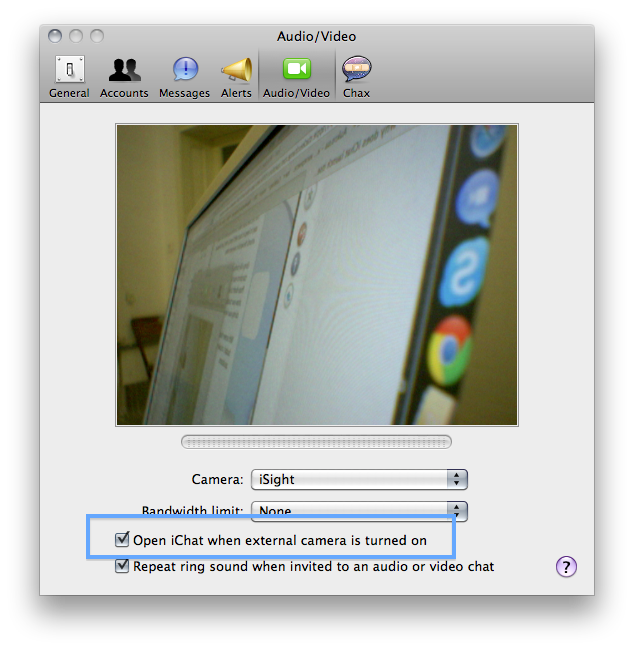 How can I make my iChat to connect again to chat server when I wake my Mac? I've used my Sony PlayStation Eye with several desktop apps. Why doesn't iChat see it? Why are iChat and FaceTime separate programs? Chrome putting itself in the Dock whenever it wants. What can I use for multi-person, single conversation, instant messaging in a serverless local network?